Cornerstone Bank and Cornerstone Insurance employees in their ugly sweaters. 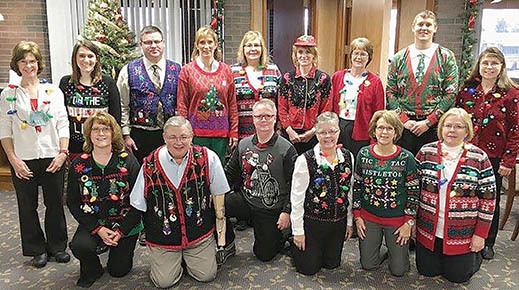 Many Albion businesses participated in “Ugly Sweater Day” last Friday, Dec. 15. Judging was held Friday evening, and Cornerstone Bank received first prize, while second place went to Jenna Schrunk of Elgin. Sentinel Building Co. employees provided a “see no evil, speak no evil, hear no evil” pose. The event was one of the many Christmas activities in Albion this season. 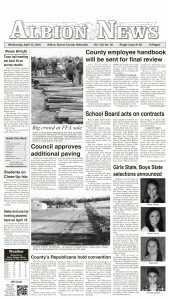 It was sponsored by Albion ThriftyWay and the Albion Chamber of Commerce.